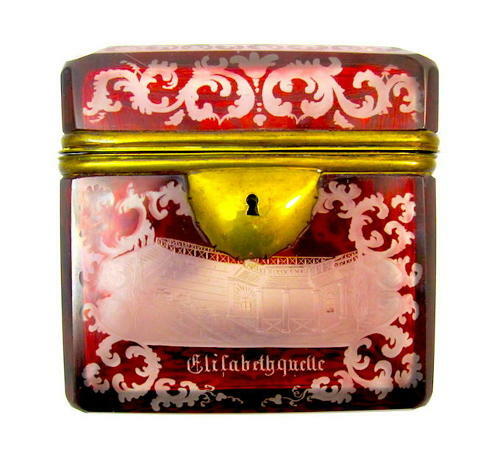 Antique Bohemian Ruby Red Cut to Clear Overlay Glass Spa Hinged Box. Each Side of the Box is Beautifully Engraved with Scroll Work and the Sides are Engraved with Birds. The Lid, Front and Back is Engraved with Views of Spa Towns. Pretty and Beautifully Engraved Spa Souvenir Box. Visitors to Spa Towns would Purchase Souvenirs and Gifts - All Kinds of Items were Produced for this Purpose, such as Walking Sticks but Generally the Souvenirs were Decorative Boxes. Views of the Town of Spa and the Surrounding Countryside were used to Decorate the Souvenirs.